Come to the first Coding Nights of 2018! It'll be a casual session of completing programming problems with others. Just make sure to bring a laptop with you. Come one, come all! Come find out what WiCS is all about and meet new people (+ free food). Finals and all sorts of end of semester stress is hitting all of us this week, so we figured it'd be awesome to have a chill coloring book session together as our last meeting of the semester. Come out to EB2 3211 at 6:00pm on Thursday, Nov 30th and enjoy some Noodles and Company! We'll provide the food, coloring pages, and art supplies, you just bring yourself and any friends you'd like. With some of our awesome officers graduating, we have some officer positions open for next semester, spring 2018! We also have one new position, Design Captain, who will work very closely with the Media Director. Read on to see how to apply and which positions are open. You are allowed to apply for multiple positions, and be sure to follow all instructions to be considered. Preside over WiCS Officer Board meetings at the request of or in the absence of the President. Act as proxy for the President at University or Student Government functions at the President’s request. Act as alternate WiCS representative at faculty meetings, in the event the President is unable to attend. Update the WiCS Google Calendar with WiCS events. Be the proactive coordinator for logistical and policy matters for all major WiCS events and happenings. Oversee officer duties or step in when an officer is unable to perform those duties. Keep records of all financial actions taken by the WiCS board. Submit the annual budget to be approved by the executive and officer boards. May submit the budget to faculty advisors and department representatives upon request. Oversee block grant requests in accordance with the WiCS Block Grant Policy. Purchase food for officer board meetings. Record officer and general meeting minutes. Handle room reservations for events and meetings. Keep track of WiCS member event sign-ins for expense reimbursement. Maintain the upkeep of the WiCS Constitution. Be the point of contact for any discrepancies and checking of the WiCS Constitution. Book rooms for member events. Update the WiCS website with upcoming WiCS events and current information (current and past officers, photos, etc.). Update the DiamondHacks website with new information. Redesign or make changes to the website if desired. Make announcements on WiCS social media accounts. Update the WiCS Instagram and YouTube channels with new photos and videos. Post about WiCS events, reminders, and opportunities on the WiCS Facebook, Twitter, and other social media pages. Photograph events and upload to Facebook, Twitter, Instagram, and the website. Make and place posters and fliers around campus. Create all digital promo images for events (to be given to the media director for the website and social media). Design any swag the organization or the hackathon needs and order them. Be able to design/create in GIMP or Photoshop and InkScape or Illustrator (previous experience not necessary but must be willing to learn). Attend officer and general body meetings. Help any of the other Officer Board members with their duties when requested. Help organize and attend WiCS events. Encourage participation and interaction between members. Spread the word about WiCS to encourage membership and attendance to meetings and events. All previous duties assigned to ambassador(s). Taking ambassador attendance for all meetings and events. Encouraging and leading the ambassador(s) in their duties (be an example for others). 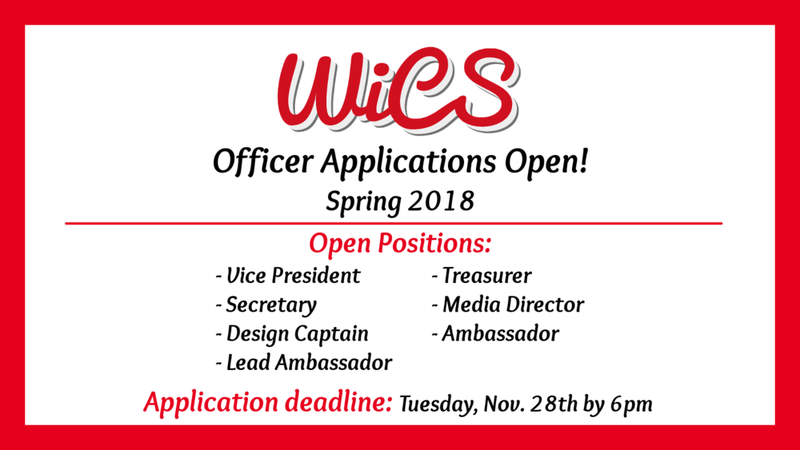 Once you are ready to apply, please complete this application: https://goo.gl/forms/hHEFU7YkbfER9Rb53 and send your resume (unityID_resume.pdf) in PDF format to wics.ncsu@gmail.com by Tuesday, November 28th, at 6:00 PM. Come have ice cream with computer scientist Dr. Maria Klawe, the first woman president of the Harvey Mudd College! Dr. Klawe is an active advocate for increasing diversity in STEM fields, with impressive results -- more than half the graduates from Harvey Mudd in both CS and Physics were women this past year. Find out whether her career path has been a "rocky road" while enjoying a delicious scoop! Please RSVP here. We're having a game night! We'll be providing tons of board games and even Cards Against Humanity. Come out and see which WiCS member has the darkest humor. ;) Pizza and drinks are as always provided. We'll be in Daniels 341 at 6:00pm on 11/9. Feel free to bring your friends along too! Can you believe it's been almost a month since Grace Hopper? I certainly can't! As always, we'll be having a recap meeting with our eight WiCS award winners this year (plus one Anita Borg scholar). The meeting will consist of a presentation with each student talking about her experience and time for open questions about GHC tips, the WiCS scholarship award, and any other things you have on your mind relating to GHC. Need a last minute Halloween costume? Want to focus on something other than schoolwork for once? Come out and join us for some arts n crafts! We'll be making masks and other Halloween themed crafts. Snacks and drinks will be provided. Coding Nights are back! Our first one will be this Thursday, September 7th, at 6:00pm - 7:00pm in EB2 1229. No experience is necessary, just bring your laptop and maybe some friends to this awesome collaborative coding event! 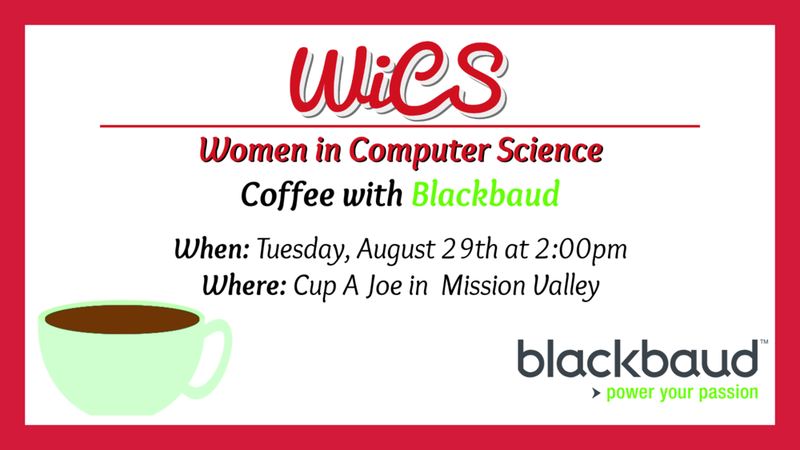 One of our amazing sponsors, Blackbaud, has offered to meet with WiCS members for coffee on Tuesday, August 29th at 2:00pm! Try to RSVP on our Facebook event here, and while Cup a Joe is in walking distance of the university, if you'd like a ride try to post in the Facebook event and see if we find you a carpool buddy. Welcome back to our current members and welcome to NC State to our new members! Hope you all had an amazing summer. Whether you were working, taking summer classes, or sleeping till noon, I hope you're all ready for the incoming sugar rush that you'll get from our annual welcome back social with cupcakes and ice cream. This year we'll be hosting it in Daniels Hall on main campus, in room 371, on Wednesday, August 30th from 6:00pm - 7:00pm. We'll also have our famous stickers and Rosie t-shirts, so come out ready to get some free swag and desserts! Check out our Facebook event here! Hello awesome members! You are invited to the NCSU Computer Science Senior Design Center's "Posters & Pies" on Wednesday, May 3, from 5:30 pm - 8:00 pm, at the James B. Hunt Jr. Library. Each student team will give a brief presentation of their Senior Design project in the Hunt Library Auditorium. After the presentations, pizza and dessert pies will be served, and you can enjoy project demonstrations and poster displays in the Hunt Library IEI Duke Energy Hall. If you plan to attend, please register online at http://go.ncsu.edu/csc-posters-pies by Friday, April 28, so that we may properly plan for refreshments. Please come and see what seniors in Computer Science can do! And see what awesome things you'll get to make when you take the capstone class of your degree! Welcome to our new website! Hopefully this one will stick around for several years longer than our previous one.